The return of the France to Formula 1 sees the return of the original Grand Prix. It was organised by the Automobile Club de France and held on 26th and 27th June 1906 on a 103.18-kilometre layout that went towards the outskirts of Le Mans and near several villages and towns. There were ten French manufacturers, two from Italy (including FIAT) and one from Germany (Mercedes). Cars started at ninety-second intervals and the winning car was a Renault, driven by Hunagarian Ferenc Szisz in 12 hours 14 minutes. Regulations included a maximum weight limit and fuel consumption of 30 litres per 100 kilometres. The Grand Prix took place at Dieppe the following year and in 1908, at which point the regulations had both a minimum weight and a maximum cylinder bore, but no fuel consumption limit. After a three-year hiatus, the race returned at Dieppe in 1912, with Coupe de l’Auto cars permitted alongside Grand Prix cars. The Coupe cars had 3 litre engines, while the Grand Prix cars were limited only by a minimum width of 1750mm. Georges Boillot won the 1539.778 km race by thirteen minutes in his Peugeot. The 1913 race was held on a public road circuit in Amiens, moving to Lyon in 1914. Mercedes took the first three spots. Grand Prix racing resumed after World War 1 in 1921 on the Circuit de a Sarthe of Le Mans. The 517.80-kilometre race took a little over four hours to complete by the winner, American Jimmy Murphy in his Duesenberg. Winning driver of te 1907 Dieppe race, Felice Nazzarro, won in 1922 in Strasbourg in a Fiat. Henry Segrave won in his Sunbeam at Tours in 1923 and Giuseppe Campari in an Alfa Romeo in 1924 at Lyon. The Grand Prix then moved over subsequent years from circuits at Montlhéry, Miramas and Saint-Gaudens, before going back to Le Mans and then to Pau, although not on the street track used in more modern eras. After two years at Montlhéry again, the 1932 French Grand Prix took place at Reims and formed part of the European Championship and the remaining races before World War 2 were held at these two venues. In 1947, the French Grand Prix resumed at in Lyon, before moving to Reims. The first Formula 1 World Championship French Grand Prix in 1950 was won by Juan Manuel Fangio in an Alfa Romeo. The following year saw one of three occasions where there was more than one winning driver, due to shared cars. Fangio and Luigi Fagioli won for Alfa Romeo. After a misfire in Fangio’s own car, Fagioli swapped cars with him during his pit stop. He was angry at having to change, finishing down in 11th in Fangio’s car, and he quit the sport. Alberto Ascari also took over José Froilán Gonzalez’s Ferrari and they jointly shared second place. The race moved to Rouen-les-Essarts in 1952 and the rest of the races until 1964 were held either here or at Reims. 1953 saw an excellent battle between Fangio and Mike Hawthorn for the lead, the Briton prevailing. 1955 was cancelled due to the Le Mans tragedy. It was Hawthorn who, about to lap Fangio in the Argentinian’s last race, slowed down to let him cross the line first and be able to complete his final lap. After the race moved to Clermont-Ferrand, the short Bugatti Circuit at Le Mans was used in 1967, but only lasted a year. Rouen held the event for the last time in 1968 and the race returned to Clermont-Ferrand, with the French Grand Prix moving to Paul Ricard, near Marseilles, for the first time in 1971. After a race at Clermont-Ferrand the following year, the French Grand Prix alternated between Paul Ricard and Dijon-Prenois until 1985, after which point a shortened Paul Ricard circuit was used until 1990. It was at Dijon in 1979 that René Arnoux and Gilles Villeneuve banged wheels in their late battle for second place. It was a Ferrari sandwich, with the 1.6 litre turbocharged Renaults of Jean-Pierre Jabouille and Arnoux taking 1st and 3rd place, the first victoy in Formula 1 for a turbocharged engine. The use of the short version of Paul Ricard followed Elio de Angelis’s fatal testing accident a few months earlier at the fast Verriere bends, the last death of a driver in Formula 1 until the San Marino Grand Prix 1994. In 1990, the Adrian Newey-designed Leyton House cars of Ivan Capelli and Mauricio Gugelmin amazed by running first and second for the majority of the race. After Gugelmin was passed by Alain Prost, his engine expired after 58 laps, while Capelli had engine difficulties too and was overtaken by Prost on Lap 77 of 80. Capelli held on to finish second. In 1991, the race moved to Magny-Cours. Although not universally popular as a venue, in part perhaps unfairly attributed to its remote location, it didn’t always produce bad races. In 1999, the top three in qualifying after a wet session was Rubens Barrichello in the Stewart, Jean Alesi in the Sauber and Olivier Panis in the Prost. Heinz-Harald Frentzen ended the race on top in the Jordan Mugen-Honda. The race started dry before it rained heavily and involved Mika Hakkinen spinning, Michael Schumacher dropping back due to an electrical problem, Hakkinen passing Frentzen and the Jordan driver ultimately coming out on top after Hakkinen had to pit for fuel. The last race until the French Grand Prix was revived this year saw Felipe Massa win after an exhaust pipe on team-mate Kimi Raikkonen’s Ferrari broke, causing him to lose power. This would be the first time the Brazilian would lead the world championship in his career. The Finn held on to second, while Jarno Trulli completed the podium in third for Toyota. This year, the return to Paul Ricard sees a revised circuit from its previous incarnation. Long straights are punctuated by some short mid and high-speed corners. So far, Mercedes are coming out on top in Friday practice, with their engine update probably helping, but Ferrari don’t generally show their hand on Fridays and Red Bull appear to be somewhere in the reckoning. Haas look to have the fourth-best car, but we have seen the young team struggle with putting together complete race weekends this year. Last edited by Born Racer; 23 Jun 2018 at 06:51. Paul Ricard - my poor eyes! A truly horrific venue visually - what's going on with all the ridiculous stripy paint? Bernie bought a job lot on the cheap! Utterly horrendous traffic on the way in, according to more than one account on Twitter. Fake Charlie Whiting probably has the best thread, though. 4hr from Marseille and they're not in the circuit yet. I'm pleased to see the French GP is finally back on the calendar, after a 10 year hiatus. Should never have been allowed to happen. Just hope we have a good race. Slavika Ecclestone owns Ricard now..... Bernie gave it to her in the divorce settlement! Poster of 2 Renaults lost on the Ricard runoff areas? I'm not as bothered by the tightened version of Verrerie, but I kind of fail to see the point of racing at Paul Ricard if you're not going to use the full, uninterrupted Mistral. I'm wondering if the front straight will be long enough to make an overtake happen; I might add, this is made harder by the fact that Pont is slower and tighter than it used to be, so the cars will spread out more heading past the pits. As far as I can tell, this is the second-longest circuit on this year's F1 calendar at 3.782 miles (baseline of 3.574 miles, plus the tightest variant of Verrerie, and then that particular iteration of the Mistral Chicane). If anyone needs a break from the paved run-offs of Le Castellet, just look up practice from Road America on the IndyCar YouTube channel. Great to see the French Grand Prix back on the calendar. It is the original, after all. But was an aesthetic disaster that circuit is. Whoever thought painting stripes all over the place was a good idea? It reminds me of the dazzle camouflage on WW1 battleships. Portions remind me of a rat maze from the copter shots and the striping hurts my eyes from all camera angles. 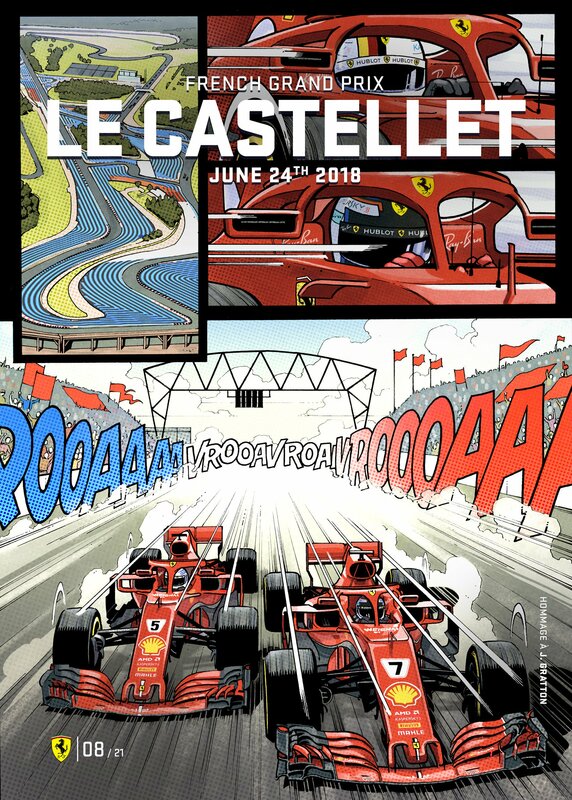 The Ferrari poster is great, referring to the track by it’s proper pre-Ricard name, ‘Le Castellet’. I wonder why they chose to do that?